Yesterday we were all in a very excited mood. Siddarth Yemmella came home from hospital. Siddarth is Rani's (My friend) new born son. Myself and Poornima went to take aarathi. We both were new to this aarathi thing. It was fun. I prepared Carrot Halwa for Siddarth's arrival. The one thing which made me feel very happy was, I prepared this sweet in just 20mts. Wow! You know, the first time I prepared this sweet, it took me 2 hrs. I learnt this sweet from my mother-in-law. She is an awesome cook. She is the one who taught me to cook, kind of like guru! 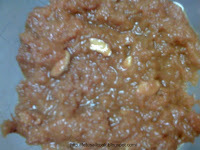 I love Carrot Halwa and so does my husband. Cardamom Powder - 1tsp or you can also use whole cardamom. This is one of the easiest sweets I have ever tried. Grate the carrot. You can also put it in blender to make it into small piece.However, the taste and texture you get while grating will be lost if you use blender. In a pan, add ghee and fry this grated carrot for 1 min. Add the milk and cook the carrot. before adding sugar. Carrot will not get cooked with sugar. Add the fried cashew and serve hot. This is a very rich and scrumptious sweet/desert. Everyone must try at least once. I love to eat this with Vanilla Ice cream. It takes me to heaven. Try out and let me know how you felt!